Most of us love basking in the warm sunny days that summer typically brings us, but we are all singing a different tune the moment we have to climb into a stifling hot car in the heat of the summer. Did you know that the temperature in your car can reach up to 120 degrees, depending on how long you leave it parked in the sun? Then, of course, you get inside and grab hold of a scorching hot steering wheel, simultaneously burning yourself on the metal part of your seat belt. Unfortunately, there’s not much you can do about keeping your car cool in the summer, besides parking in the shade and cracking your windows, but there are a few ways you can protect yourself from scorching seat belts and steering wheels. Shearling steering wheel cover – This custom steering wheel cover puts luxury right at your fingertips, with a 100% shearling construction and designed to fit your car’s steering wheel year after year. 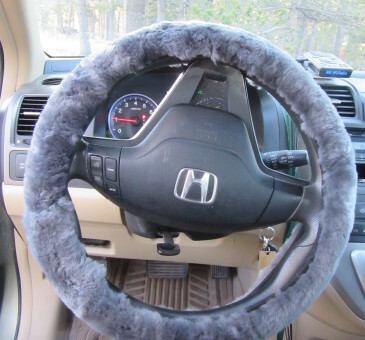 Use your sheepskin steering wheel cover year-round for extra warmth and comfort in the winter months too! Sheepskin seat belt cover – Made from the same luxurious sheepskin material as your favorite car seat covers, this seat belt cover will protect your neck from being rubbed raw by your seat belt, and keep the hot belt off your chest on toasty warm days, too. The stylish seat belt cover also features a Velcro closure for easy on and off. All of our shearling products are handmade to order using genuine skins from domestic sheep that are raised commercially for their meat in the Rocky Mountain region of the United States. The skins are a valuable by-product of the sheep, and feature silky wool on one side with attractive suede on the other, for a stylish and durable product that you can enjoy for years to come. You probably have several sheepskin items in your closet and in your home (think shearling slippers and cozy sheepskin throws) so why not in your car as well? Treat yourself to a handmade sheepskin steering wheel cover or seat belt cover today, and beat the heat in style this summer! Kendall Jenner has been announced as the official face of Fendi’s Fall 2015 fashion campaign, and the 19-year-old runway model looks chic as ever wearing a white sheepskin jacket and dark brown shearling coat in the campaign’s new advertisements, which were released just last week. Kendall Jenner has long been a favorite of Fendi’s creative director, 81-year-old Karl Lagerfeld, and after celebrating his 50th year with Fendi by putting together an all-fur collection for this year’s Paris Fashion Week, the German fashion legend dressed Kendall in two different sheepskin coats for Fendi’s new Fall ad campaign. It’s been less than a week since the close of Paris Fashion Week, where Kendall Jenner played a big part in the Versace, Givenchy and Chanel shows, and the runway model has wasted no time moving on to her next project – Fendi’s Fall 2015 campaign, where you can see her sporting a variety of stylish outfits, including a white sheepskin duster and a dark brown shearling coat. Kendall’s white shearling duster is matched in the campaign ads with a pair of color-blocked pants and black boots, and the model’s brown sheepskin jacket goes great with an oversized pink Fendi purse. Kendall Jenner must be thrilled to be the face of the Fall Fendi campaign, and the model took to Instagram last weekend to share a photo of her sporting the dark brown sheepskin jacket in this month’s subscriber’s issue of Harper’s Bazaar. Kendall captioned the Fendi photo: “New @Fendi shot by Karl Lagerfeld…NO BIG DEAL.” Landing the Fendi campaign may not be a “big deal” for the model, who has worked with every high-fashion designer who’s anybody and walked in dozens of runway shows, all before the age of 20, but the campaign is still a big plus for her modeling career. We had to admit, we love seeing Kendall Jenner and other A-list celebrities in sheepskin, and in our opinion, both the white shearling duster and brown sheepskin coat look great on the 19-year-old, who has donned shearling plenty of other times in the name of fashion. Are you now wondering how you can dress like Kendall without shelling out big money on a Fendi original? Check out our genuine shearling coats and vests from The Sheepherder, and get a handcrafted sheepskin item custom-made to fit your specific measurements, without the haute couture price tag. From sheepskin slippers to jackets, accessories and home goods, our handmade shearling products are authentic, affordable, and most importantly, stylish! According to Vogue, Sheepskin Boots are Back in Style This Year! Ugg-style sheepskin boots have always had their detractors (though we can’t imagine why, considering how warm and comfortable they are), and the footwear hit its style peak close to a decade ago. But, like many things do, sheepskin boots are coming back in style this year, according to Vogue magazine, and we thought you’d like to be the first to know! The magazine published an article recently predicting the return of the cozy sheepskin boot to the high-fashion fold, thanks to a new generation of style-savvy stars who crave the warmth and comfort that can only be found in a genuine shearling boot. Believe it or not, the pinnacle of the sheepskin boot was way back in 2004, when Sienna Miller rocked hers with a bare, natural face and sun-kissed hair – bohemian style – and now the footwear is shoe-in for a big fashion return in 2015. Preferred by fashion designers and celebrities like Kate Moss and Sarah Jessica Parker, as well as moms, teens and everyone in between, the sheepskin boot is a simple yet stylish addition to any outfit – dressy or casual. Basically, anything you might normally wear with an ankle boot, try pairing with an authentic shearling boot instead. 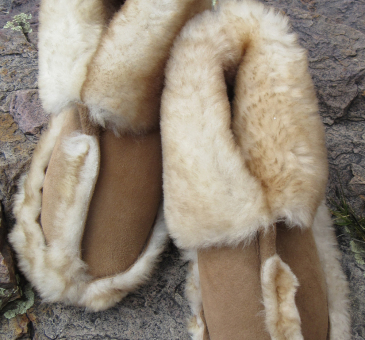 Check out www.customsheepskinjackets.com now and get your own pair of genuine Minnetonka sheepskin boots today! The spring and early summer seasons always have people looking for ways to revamp their décor and bring a bit of light, comfort and luxury into their homes after a long, dark winter. Sheepskins are one simple way to enhance your home’s summertime décor and immediately achieve a textured, high-end look that won’t break the bank. Once a cozy statement piece relegated to the floor, sheepskins are making their way off the floor these days, and into the rest of the house and beyond. If you’re searching for ways to achieve a clean, effortless and cozy look inside the house and out this season, the best way to go about it is to add a few elements of natural shearling to the mix. The following are five easy ways you can add a bit of sheepskin chic to your décor this summer. Get yourself a shearling seatbelt and steering wheel cover. It’s never fun getting into your car in the middle of winter and grabbing onto a freezing cold steering wheel, and the same goes for getting into a boiling hot car in the summer. Treat your poor hands to a little bit of luxury this summer with a handmade shearling steering wheel cover, and while your add it, get yourself a matching sheepskin seatbelt cover to match! Decorate with sheepskin throws in the nursery. Adding sheepskin touches to nursery décor has become a popular trend recently, especially since a recent study found that babies who sleep on sheepskin are less likely to suffer from asthma and allergies. Whether you opt for a handmade sheepskin throw in your baby’s crib, or a plush shearling rug to offer protection from hardwood flooring, the soft, luxurious material adds a cozy element to any nursery that your baby will love. Curl up to shearling pillows on the living room couch. In our opinion, you can never have too many pillows on the living room couch, because that’s typically where everyone gathers in the evenings to chat, watch TV or enjoy a family game night. Add a couple of beautiful custom shearling accent pillows to your couch, and you have an instant conversation-starter and comfortable place to curl up with the family in the evenings. Add a sheepskin accent throw to your bed. We usually strip down our beds in the summertime so we can sleep comfortably in the hot weather, but what about those chilly evenings that have you getting up on the middle of the night in search of warmer clothes? Consider draping a sheepskin patchwork quilt over the bottom part of your bed to add a little flair to your décor, and so that you don’t have to go far to find warmth on those brisk evenings. Treat the little ones to a sheepskin in their “gaming” room. This may be a new thing happening, but some people are buying shearling bean bag chairs or putting sheepskin rugs or throws down on the floor in rooms where their children typically gather to play video games. It’s true though, die-hard gamers will love cozying up to comfortable sheepskin, especially those who prefer to play Mario Kart while lying on the floor, rather than sitting in a chair like the rest of us! If you’ve ever purchased a pair of authentic sheepskin slippers, you know that keeping them free of dirt and grime, and cleaning them properly when they do get soiled, is the key to making them last as long as possible. That’s why we try our best to make sure our customers know exactly how to clean and care for their handmade sheepskin slippers and outerwear, which products are best to use, and how to avoid an unnecessary, and potentially costly, trip to the dry cleaners when possible. The first and most important product we recommend that you use on your shearling slippers is a rain and stain shield made specifically for suede or leather, especially if you ever plan to wear the slippers outdoors. Specially formulated to repel water, the non-silicone rain repellent will protect your slippers from water spotting and help them resist soiling as well, even when you wear them day after day (which is exactly what we expect you’ll want to do!) To remove spotting on the suede or leather, a suede conditioner or cleaner should do the trick. Another great product for genuine sheepskin coats and other garments is regular old hair shampoo or a mild detergent, which you can use with a rag and cool water to just blot the soiled area of shearling. Without soaking through to the suede, carefully rinse and hand blot the excess moisture with a towel, and then let the sheepskin air-dry outdoors, out of direct sunlight to avoid fading. When the wool is nearly dry, brush it out until the shearling in the area you cleaned is fluffed up to match the rest. As with any garment, your best bet for being able to clean your sheepskin slippers on your own, without an expensive trip to the dry cleaners, is to treat the spot or stain as soon as it occurs. If you let it marinate for a few days, the chances of easy removal are slim to none. That being said, if your sheepskin slippers or shearling jacket become soiled overall, it’s probably a good idea to take them to a professional dry cleaner that has experience cleaning suede, leather and/or sheepskin. Sheepskin is a naturally durable material, and our custom shearling slippers and garments are made to last for years with the proper care. By following our recommendations for sheepskin cleaning and care, you can continue to enjoy your handmade shearling item from The Sheepherder for years to come. While looking for some wedding ideas for a friend of mine who is getting married this winter, I came across a bridal website with some photographs of bridesmaids in these beautiful summery pink chiffon dresses and…..you guessed it, sheepskin! The entire bridal party was wearing matching ivory colored vests made out of soft, luxurious sheepskin, and the bride paired her white lace gown with a similar but distinctive shearling vest in a warm camel color. The result? A perfect opportunity to incorporate a warm, cozy, simple and beautiful sheepskin accent into your rustic mountain wedding. Rustic weddings are definitely in vogue right now, and while the ultimate rustic wedding décor can be achieve with some burlap, lace, flowers, barn wood and candlelight, it isn’t always easy for your bridal party to emanate a rustic but romantic vibe. After stumbling across these wedding photos though, I believe that outfitting your bridesmaids in matching sheepskin vests could be just the ticket. If you’re looking for that last little piece that brings your rustic mountain wedding theme together, check out our Ladies Wrangler Sheepskin Vest, our best-selling shearling vest for women. With its slim, form-fitting silhouette, our ladies sheepskin vest cuts a flattering figure for women of all shapes and sizes. The vest is handcrafted using only the highest-quality sheepskin, which features hollow fibers that allow the skin to breathe and wick away moisture from the body. This means if your bridesmaids choose to wear their shearling vests all day and night, they will stay nice and cool during the warmer weather, and toasty warm when evening falls. Furthermore, the vest’s subtle accents, like its wool-out trim and genuine antler toggles, will be the picture of perfection in a rustic mountain environment. Our Ladies Wrangler Sheepskin Vest comes in a variety of colors, including Sahara, Antique White, Basic Black, Ranch, Gold Misty, Ivory, Grey, and Pink and White, so you have a variety of colors to choose from when matching the shearling vests to your bridesmaids’ dresses. And with our vests’ durable authentic sheepskin construction, your bridesmaids will have a beautiful custom made shearling vest that they can wear for years to come. So go ahead and check out our handcrafted ladies sheepskin vest, a perfect rustic accent for weddings at any time of year – winter, spring, summer or fall. Some people love the look of sheepskin, but opt for a knock-off version or imitation sheepskin because it’s cheaper. That’s all well and good, but it’s important to understand that there is a big difference between genuine sheepskin and imitation sheepskin, especially when it comes to the quality and durability of the garment you’re purchasing. Here at The Sheepherder, all of our shearling products are made by hand using only the highest-quality sheepskin, which guarantees that our customers receive a beautiful shearling garment that, with the right care, they can enjoy for years to come. The following are the top five reasons you should choose authentic sheepskin over synthetic. Quality – There is a difference between designer jeans and jeans you buy at Walmart, just like there is a difference between authentic sheepskin and imitation sheepskin. Sure, you can find shearling products for less at a third-party retailer or big box store, but in this case, it’s likely that the price reflects the quality of the product. Those cheaper sheepskin slippers you found online were probably made using synthetic shearling, or perhaps they didn’t meet the quality control standards applied to each and every one of our sheepskin products, and are thus being sold at a lower price. Either way, the quality just isn’t there. Made in the USA – All of our sheepskin coats, slippers and home goods are handmade right here in the United States, which means you know exactly what you are getting when you place an order with The Sheepherder. Our shop is located in the historic town of Alma, Colorado, and is locally owned and operated by Diane Blessing, who has more than 30 years of experience creating custom sheepskin garments. Each and every item we have for sale, both in the shop and online, is handcrafted by Diane herself, using sheepskins from the finest tanneries in the United States. Function – Sure a pair of synthetic sheepskin slippers may look cute, but without the benefits of a genuine shearling construction, that’s about all they’ll do. Authentic sheepskin is a natural material with hollow fibers that allow your skin to breathe and that wick away moisture from the body, which means genuine shearling slippers will keep your feet toasty warm during those cold winter months and nice and cool during the hot summer months, for easy year-round wear. Handmade to Order – One of the most important benefits of ordering a handcrafted sheepskin garment from The Sheepherder is that all of our products are custom made to order. That means your beautiful shearling coat or deerskin vest will be created based on your specific measurements for a guaranteed great fit. Also, because our shearling garments are handcrafted by a professional from authentic sheepskin hides, they are some of the most beautiful and durable shearling products available. 5. Customer Service – We’ve said it before, and we’ll say it again. Customer service is our top priority, and we love keeping our customers happy. All of our sheepskin products are guaranteed for a full year for workmanship and materials, and they are further guaranteed for fit, since each order is accompanied by a custom fitting sheet detailing the proper measurements for each individual customer. Order your handcrafted sheepskin garment today and your satisfaction is guaranteed! 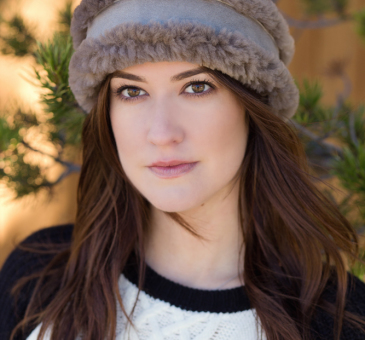 Ladies Sheepskin Earband – Not everyone likes to wear a hat in cool weather, and for those hoping to avoid ruining a good hair day this spring, a chic and cozy sheepskin earband is the perfect gift. Our shearling earbands feature a wool-out trim that really kicks the style up a notch, and a soft elastic back makes for a secure and comfortable fit. Check out our ladies sheepskin earbands in antique white, black, gold misty, grey, ivory, pink, ranch and sahara, for an attractive and warm accessory to match any outfit! Genuine Shearling Gloves – During the winter and on chilly evenings, there’s nothing worse than getting in the car and grabbing hold of a freezing cold steering wheel. For moms who always seem to be on the go, another great sheepskin Mother’s Day gift is our sleek and attractive shearling driving glove, made from a 100% genuine sheepskin hide and guaranteed to keep Mom’s hands warm and comfortable as can be. Ladies Wrangler Sheepskin Vest – Depending on how much you want to spend on your gift, our Ladies Wrangler sheepskin vest could be a great choice for Mother’s Day. With a slim, form-fitting silhouette, the cozy shearling vest is the perfect option for any outfit, dressy or casual. The authentic sheepskin vest also features attractive wool-out trim and loops with antler toggles for closure. Sheepskin Slippers for Women ­– Nothing beats getting out of the bed in the morning and stepping into a pair of lush slippers handmade from the finest sheepskin available in the United States. This Mother’s Day, consider gifting Mom a pair of handcrafted shearling scuff slippers featuring a durable cowhide sole and natural insulated wool that will keep her feet warm in the winter and cool in the summer! Sheepskin Home Goods – If Mom already has enough clothing and footwear to last a lifetime, she might prefer a Mother’s Day gift that she can put to use in other ways, like a handcrafted sheepskin steering wheel cover or protective iPhone case. Both items are affordable, durable, and available in a variety of colors to suit her style. Another great sheepskin Mother’s Day gift is our handmade shearling pillow, made entirely of sheepskin, inside and out, with soft, luxurious wool on one side, and durable suede or leather on the other. Keeping Our Customers Happy….and Warm Too! Hi Diane – My new coat came yesterday and it’s great. The fit and finish is perfect; thanks so much for making it for me. See you next year at the NFR. Thank you. Hi Diane, the jacket has arrived and is wonderful. Thank you very much! Greetings from Jörg from Berlin Germany. I am so pleased with the booties I ordered for my little boy. Diane made a special effort to make them bigger when the original size turned out to be too small for him. He loves to wear them. It is great quality deerskin and very well made. I know inside or outside they will be durable for quite some time. Thanks for the wonderful experience with Sheepherder! Order Your Genuine Sheepskin Garment Today! We know that reading client reviews is an important part of the process for potential customers shopping online, and we want you to know that doing everything we can to ensure customer satisfaction is an important part of ours. We use only the highest-quality materials for our handmade sheepskin slippers, jackets and accessories, and the craftsmanship of our products is second to none. Plus, because every shearling product we make at The Sheepherder is handcrafted according to your own specifications, you can rest assured that your custom sheepskin item will be the perfect fit! It may seem now like there is no end to winter in sight, but before you know it, flowers will be blooming and spring will be upon us, so don’t wait too much longer before adding some key spring items to your winter wardrobe. If you’re going for versatility and style, try one of our handmade sheepskin vests for men and women. The perfect piece to transition from winter to spring, a shearling vest offers the comfortable warmth of genuine sheepskin without the bulky outline of a full-on winter coat. And the natural versatility and flair of a genuine sheepskin vest means you can transition it from daytime wear to date night out without a second thought. Nothing beats the toasty warmth of genuine sheepskin, and our handmade shearling vests are made to naturally retain your body heat, while offering the sleek, form-fitting silhouette of a vest over a winter coat. Both our shearling and deerskin vests for women are comfortable and stylish, and you can continue to wear either item into summer and fall, even as the weather warms up, for protection against those cool evenings. Pair our Ladies Wrangler Sheepskin Vest, Ladies Silverheels Shearling Vest, or Ladies Blue Sky Deerskin Vest with a cute plaid button-down shirt and jeans for a casual trip into town, or glam it up with a sweater or dress for a night out with the girls. If there’s one item we make at The Sheepherder that’s just as popular for men as it is for women, it’s our handmade sheepskin vest. A handsome and practical outerwear option, we have plenty of shearling vests for men to choose from. There’s the Men’s Gambler Sheepskin Vest with its classic, clean lines and natural antler buttons, and then there’s the Men’s Rancher Shearling Vest, the perfect choice for the outdoorsy type, with attractive wool-out seams and large hand-warmer pockets. The best part is, our men’s sheepskin vests look just as good with a button-down shirt and a pair of jeans as they do with a dressier outfit, so you just can’t go wrong with this choice. All of our sheepskin vests at The Sheepherder are custom made to order, which guarantees a perfect fit based on your specific measurements. This goes for the little guys too, who want nothing more than to look just like Mom or Dad, which means you are tasked with finding miniature-sized versions of your own sheepskin vests. Well, look no further. We offer a beautiful Sheepskin Buckaroo Vest for Kids and a Children’s Lakota Cowhide Vest, both of which are great outerwear options for kids to wear year-round, since genuine sheepskin will naturally keep them warm in the winter and cool in the summer. Both kids vests come in a variety of colors too, so you can easily choose one that matches your little guy or girl’s personality and style!